Modulation techniques are key elements when implementing large telecommunication networks with high throughput. These techniques are specifically vital when systems are designed to operate at 10/ 40Gbps, as the performance of these systems degrade significantly due to the interaction between dispersion and the non-linearity of ﬁber. Optical modulation describes the controlled adjustment of the optical signal’s amplitude before its propagation through the network. A number of different schemes can be used to perform the modulation function. These include, among others, Return-to-Zero (RZ), Non-return-to-zero (NRZ), Sinusoidal Same Phase Modulation (SaPM), Alternate Mark Inversion (AMI) and Intensity modulation. In older telecommunication systems that achieved data rates higher than 10Gbps, NRZ was often used. As the RZ technique caters for nonlinear effects, it is more appropriate at higher data rates. Intensity Modulation is the simplest of the schemes mentioned. This modulation is also known as On-Off Keying (OOK) or Amplitude Shift Keying (ASK). The Intensity Modulation scheme is incoherent in that the receiving side detects the absence or presence of energy during the bit interval. This scheme is often used for shorter distances and can be used with LD and LED sources. It is very effective with LEDs because it is incoherent. 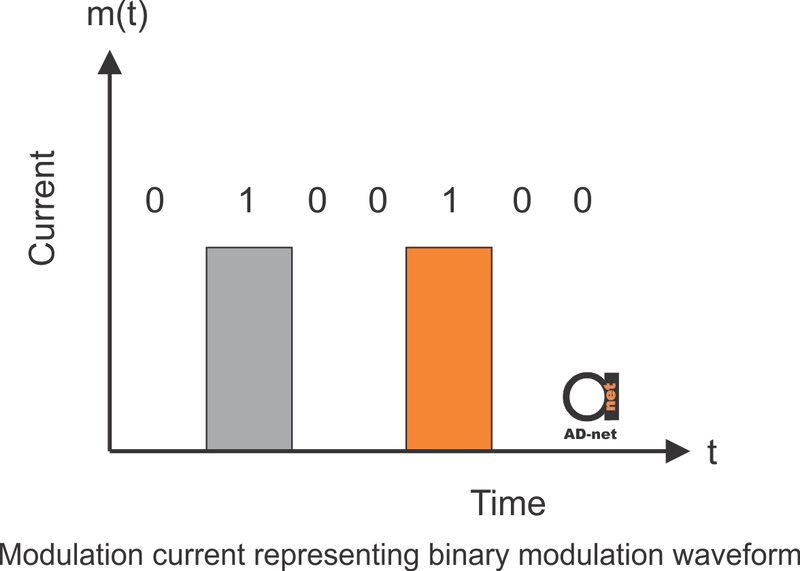 With IM modulation, the output of an optical source mirrors the binary input sequence. Modern day telecommunication systems are complex and able to achieve high throughputs ranging from 10Gbps to 40 Gbps. The characteristics of these systems are vastly different from their predecessors and they are highly reliable over wide ranges of working conditions. This resulted in advanced research into optical modulation formats. Many of the modulation formats described in the previous section have been made obsolete by modern network requirements. The requirements of fiber optic transmission are very different from those of CATV systems or microwave transmissions. None of the modulation formats can cater for all the different sources of performance degradation. A careful selection of advanced modulation formats will however improve system performance by reducing the effect of the major sources of performance degradation.